SON, G. , KWON, S. , LIM, Y. Although smart devices have become a widely-adopted tool for communication in modern society, it still requires a steep learning curve among the elderly. By introducing a voice-based interface for smart devices using voice recognition technology, smart devices can become more user-friendly and useful to the elderly. However, the voice recognition technology used in current devices is attuned to the voice patterns of the young. Therefore, speech recognition falters when an elderly user speaks into the device. This paper has identified that the elderly's improper speech rate by each syllable contributes to the failure in the voice recognition system. Thus, upon modifying the speech rate by each syllable, the voice recognition rate saw an increase of 12.3%. This paper demonstrates that by simply modifying the speech rate by each syllable, which is one of the factors that causes errors in voice recognition, the recognition rate can be substantially increased. Such improvements in voice recognition technology can make it easier for the elderly to operate smart devices that will allow them to be more socially connected in a mobile world and access information at their fingertips. It may also be helpful in bridging the communication divide between generations. Korea National Statistic office. "Social Survey; Welfare Category; Difficulties Experienced by Senior Citizens, Official Statistics Research Newsletter, vol.5, pp.2-3, 2013. W. S. Kang, M. S. Kim, J. W. Ko, "Effects of the smartphone information use and performance on life satisfaction among the elderly," Korean Gerontological Society, vol.33, no.1, pp.199-214, 2013. B. C. Sonies, "Oral-motor Problems," Communication Disorders in Aging: Assessment and Management, Washington, Gallaudet University Press, pp. 185-213, 1987. J. W. Bennett, P. H. H. M. Van Lieshout, C. M. Steele, "Tongue control for speech and swallowing in healthy younger and older subjects," International Journal of Orofacial Myology," vol.33, pp.518, 2007. J. C. Kahane, "Anatomic and physiologic changes in the aging peripheral speech mechanism," Aging: Communication processes and disorders, pp.21-45, 1981. S. Y. Lee, "The overall speaking rate and articulation rate of normal elderly people," Graduate program in speech and language pathology, Master these, Yonsei University, 2011. W. J. Ryan, J.William, "Acoustic aspects of the aging voice", Journal of Gerontology, vol.27, no.2, pp.265-268, 1972. Y. H. Kim. "Geriatric speech. plenary session IV," Yonsei University College of Medicine, Otolaryngology clinic. pp.205-207, 2003. W. H. Manning, K. L. Monte, "Fluency breaks in older speakers: implications for a model of stuttering throughout the life cycle," Journal of fluency disorders. Vol.6, no.1, pp.3548, 1981. J. D. Harnsberger, R. Shrivastav, R. Brown, W.S. Rothman, H. Hollien, "Speaking rate and fundamental frequency as speech cues to perceived age," Journal of voice, vol.22, no.1, pp.58-69, 2008. M. Richardson, M. Hwang, A, Acero, X.Huang, "Improvements on speech recognition for fast talkers," Eurospeech, pp.411-414, 1999. S. Kwon, S. Kim, J. Choeh. "Preprocessing for elderly speech recognition of smart devices," Computer Speech & Language. vol.36, pp.110-121, 2016. 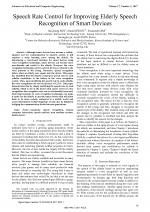 A. Aniruddha, M. Mathew, S. Amantula, C. Sekhar, "Gammatone wavelet Cepstral Coefficients for robust speech recognition," TENCON 2013, pp.1-4, 2013. W. Verhelst, M. Roelands, "An overlap-add technique based on waveform similarity (WSOLA) for high quality time-scale modification of speech," Acoustics, Speech, and Signal Processing(ICASSP), vol.2, pp. 554-557, 1993. W. Verhelst, "Overlap-add methods for time-scaling of speech. Speech Communication," vol.30, no.4, pp.207-221, 2000. C. d'Alessandro, "Time-frequency speech transformation based on an elementary waveform representation. Speech communication," pp.419-431, 1990. D. Henja, B. Musicus "The solafs time-scale modification algorithm," Technical Report of BBN, 1991. S. Kwon, "Voice-driven sound effect manipulation," International Journal of Human-Computer Interaction, pp.373382, 2012. S. Dusan, L.R. Rabiner, "On the relation between maximum spectral transition positions and phone boundaries," INTERSPEECH, pp.17-21, 2006. 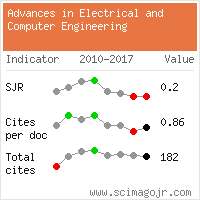 Citations for references updated on 2019-04-19 10:54 in 75 seconds. Website conception, design and maintenance by Eugen COCA. Content updated on 28 Feb 2019. Site engine updated on 28 Feb 2019. This page was generated on the server in 0.044 seconds and loaded in your browser in > seconds.